Plain and simple, organise a game of skirmish... but with a twist. 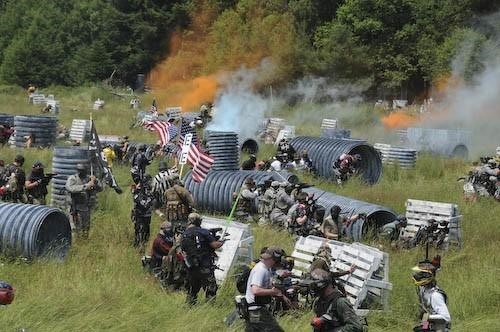 This game of skirmish involves the use of modified paintball guns... that instead of shooting paintballs it shoots firewords. Find either a nice open area, public block, or a small closed off area to play in. Split up into 2 teams, or decide on every man for themselves and set an objective. Play skirmish with fireworks rockets being shot left right and center, both close quarters and long-range. Remember to have medical staff near by just incase somebody gets their head shot off.